Team communication is essential to any production. Creativity thrives with collaboration. Engagement solves problems. Add Facebook-style messaging to keep your team engaged, involved and updated. Communicating with your team usually involves endless phone calls, huge email lists, stacks of paper and a great high volume texting plan. Constantly jumping from one communication channel to another. And worrying if you did remember to add everyone that should have the message this time. 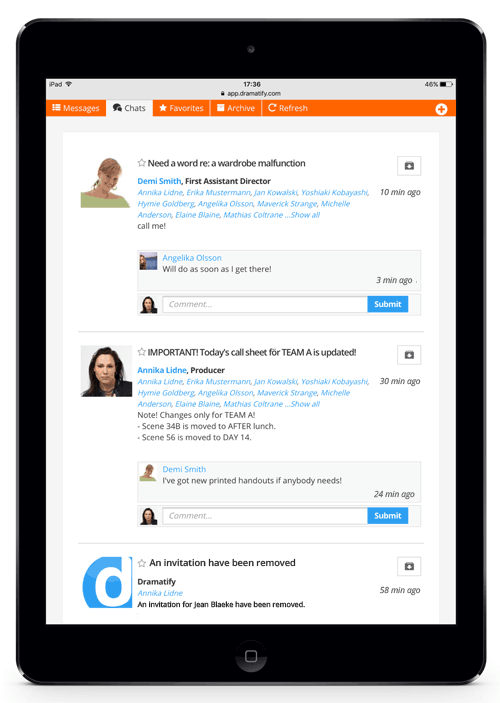 Dramatify’s team oummunication feature allows you to message the entire team, certain departments, department heads, job roles or selected persons with a click. You don’t need their email addresses or even know their names. They only need to have been invited to join your production on Dramatify by someone in your team. Your messages, and that of the team’s, as well as any comments are presented either as a Facebook-style newsfeed or as a Gmail-style message list. The newsfeed feature mixes email and Facebook-like status updates. You can send messages and your team can comment on your post and each other’s comments – or write posts of their own. This breeds great collaboration and puts everyone on the same page. Especially for teams in different locations and different time zones, this means easily readable conversations and updates regardless of time and place. You can also be certain that team members get your messages as long as they have been invited to the production, even if they have never registered or logged in. Each new message is also sent to each recipient’s registered email address, unless you manually turn it off. This also mean that you can later retrieve entire conversations if need be for verification or legal reasons. All messages automatically forwarded to recipients' email inboxes.